You know, I could really use some wings right now. These legs are just not working for me. No....wait! I need to "Vitalize My Body And Mind" for just $2.50! Where could I find something so amazing? How about at the checkout line of every convenience store and major supermarket chain (including Whole foods - yes, I am looking at you, Whole Foods - that "Green Tea" Energy shot isn't fooling anyone)? Snack Girl has received many questions on "5 Hour Energy Shots" and the other knock off shots such as the one photographed above. Improves performance, especially during increased stress or strain. Well, these statements have not been evaluated by the FDA. Huh? Okay, so Red Bull can just put anything on their bottle? Why not improves sexual performance or ends baldness? I want a drink that will do windows and makes all the snow in my yard evaporate never to return. Anybody got a drink for that one? Why can Red Bull make these claims? Well, it turns out there are third party studies that show that Red Bull Energy Shots actually do these things. So, I took a look at these scientific, peer-reviewed studies, and found that their conclusions - that CAFFEINE, TAURINE, and GLUCURONOLACTONE can stimulate your metabolism etc., is supported by scientific evidence. Yes, this stuff can make you sharper in the short term. So, Red Bull has 80 mg of caffeine equivalent to "a cup of premium coffee" (as does 5 Hour Energy). Monster Energy drinks have 160 mg of caffeine and the only way to get that information is to call them. It is not on their can and not on their website. Since, I am a coffee drinker, I decided to go ahead and drink this Red Bull Energy Shot and see what would happen. It tastes like Kool Aid, and, frankly, I didn't feel any of the benefits. 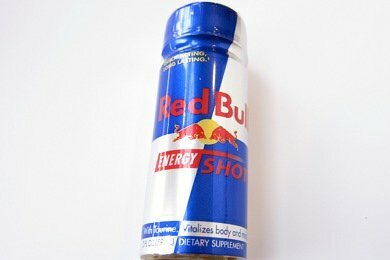 Is it really fair to compare "Red Bull Energy Shot" to a cup of coffee? I don't think so. The reason is that you will slowly sip a cup of coffee and you will chug an Energy Shot. Caffeine is a natural part of the coffee, while the Energy Shot just has some chemical caffeine added. Same drug but different methods of obtaining it. My real problem with these Energy Shots is that, unlike hot coffee, you could drink 5 of them in about a minute and have a real rush. Why do I know this? Back in May, I posted this article on Monster: The Worst Snack You Can Drink. In that post, I talk about my experience drinking a Monster and Mountain Dew combo that almost blew my head off. These "Energy Shots" are simply a way to get a buzz. For REAL energy - try sleeping, exercising, eating healthy, and meditating. Please share your thoughts on Energy Shots. I not only agree with you, I think these drinks are down right dangerous. Marketing targets young people who drink them all day everyday. Totally agree! So good to hear that this is in the "Worst Snacks" category! I have tried Red Bull one time in my life and it was the worst I've ever done. I felt anxious, nervous and crazy, but never good. Were those the wings?? I felt far away from heaven for doing that to my precious health!!! That stuff scares me. I love my daily cup of coffee for it's antioxidants, diabetes prevention, and of course the taste. I know it's a drug delivery system, but it's one that my husband and I enjoy (we make French press on weekends). I agree 1000000% I will never ever drink death in a can... full of sugar and just down right CRAP! My son got kidney stones from drinking these energy drinks. Please beware of them. Lesson learned the hard way for him. These things are toxic. If I want some wings I have coffee in the morning and then later in the day I have some green tea with honey.. I don't need cocaine in can! I was so happy to see this post and the comments. These drinks are horrible for your kidneys! The really sad thing is because of marketing young people are hooked on them! Stay away! These energy drinks are pure crap! Now Red Bull has a sugar free product. So lets just add a whole lot more crap into their ingredient list. Stay away!!! Why not swallow a great multi-B Vitamin and/or some sublingual B12 and drink a nice strong cup of Green and/or Black Tea? That always works for me, and it's about 1/10th of the price. ;-) I love my hot tea in the morning, and in the winter, I drink it more than that. I'm not a coffee gal, so tea is my love! These are evil concoctions indeed, both the shot size and the full size. I used to drink them routinely until I tried a new brand and felt very poorly -- sweats, palpitations, the whole nine. They're nothing but poison, even though the marketers want you to think they're beneficial for you. If I want to get my motor going nowadays, I enjoy a refreshing, delicious plant-based beverage rich in antioxidants. An ancient botanical punch originating in Asia. I am of course speaking of good old fashioned TEA! Legend has it that in ancient China, the emperor liked his drinking water boiled before he drank it, so that is what his servants did. One day, a servant began boiling water for him to drink, and a dead leaf from a wild tea bush fell into the water. It turned a brownish color, but it was unnoticed and presented to the emperor anyway. The emperor drank it and found it very refreshing, and tea. came into being. So why drink toxic, poionous craparoo when you can drink a natural beverage that's fit for an emperor? Pass the Lipton's green,please! However there is something about the taurine and the gluco-whatever you mentioned, even though there is less caffeine than coffee, that gives me a non-wired alertness. It also has less volume--so I'll drink an energy drink when I have a long distance (as in longer than two hours) road trip if my energy starts to flag. But I wouldn't want to take all of those chemicals in all the time either, AND it's pretty expensive. I agree that these things can have a place in rare circumstances. I find them extremely valuable on long drives - whatever they have in them is healthier than falling asleep and slamming into a bridge! (LOL) Still, the perceived need for them may just be the Universe's way of telling you you are too busy! My heart is racing just THINKING about drinking one of those! Just wanted to comment about the mention that these type of drinks caused a woman's son to develop kidney stones. While this may be true it is not as simple as the drink causing it but your son overdoing in and perhaps taking in more of something (such as oxalate or uric acid which cause stones) and thus alterating the urine saturation which equals stone formation. For example the wonderful tea (specifically green but all) can also cause kidney stones as it has a high oxalate content. Therefore referring to energy drinks a poision causing kidney stones is slighlty incorrect. I'm surprised that no one here has a problem with using caffeine in general. I'm not one to say that coffee is totally evil, but we do know that many people are addicted and use the coffee (more than tea, which has lower amounts of caffeine) basically as a drug. You can't tell me that people who go to Starbucks and get a "red eye" (coffee with a shot of espresso) are doing so in a "healthy" way that involves slowly sipping it. With all due respect (because I love your blog) I think you missed something here, Snack Girl. I guess I'm in the minority but I use these energy shots frequently (avg 2-3 times a week). Used to be a daily coffee drinker but something in coffee gives me headaches. I had a bad case of pneumonia, stopped drinking coffee for two weeks and my headaches went away. Started drinking coffee again and headaches came back. I used to add cream and 2 teaspoons of sugar to my coffee to make it drinkable anyways so I don't see much difference than having a shot of red bull or drinking a can of cola in the morning, which many people do in lieu of coffee. I do agree that these shots should be consumed in moderation and that there might be complications with the kidneys if abused. On a day I feel particularly tired, I take a half shot in the morning along with about 12 ounces of water, and repeat after lunch. I don't see a problem with energy shots as long as they are not abused. Also, the levels of caffeine in red bull shots and 5-hour energy are much more controlled than say brands like Monster and Rockstar which are LOADED. And yeah I agree the best scenario would be to get a good night's sleep every night, but that's not always possible in the real world.